Readers sound off on gun rights, the Jean Quan recall, and pathogens in pot. Had this article presented a scintilla of evidence to support any allegations made by its writers, one might be more prone to consider the arguments. But hyperbole and soap-box soliloquy don't stand for much when a decision is to be made based on fact. Florida, a state where widespread voter fraud was proven in a 1997 Miami mayoral primary, initiated (by Florida legislature passing a state law in 1998) corrective procedures to verify that votes are cast legally, and the votes being cast are not those of persons deceased, those with felony convictions, and those adjudicated mentally incompetent. The current process seeking federal database records to ensure votes are cast by US citizens is an extension of that validation process. Why any thinking citizen should abdicate the choosing of elected leaders (at any level of government) to a process subject to fraud is beyond the scope of this politically-based article. In the Miami election, the trial judge, Thomas S. Wilson Jr., concluded that "the evidence shows a pattern of fraudulent, intentional and criminal conduct that resulted in such an extensive abuse of the absentee ballot laws that it can fairly be said that the intent of these laws was totally frustrated .... This scheme to defraud, literally and figuratively, stole the ballot from the hands of every honest voter in the city of Miami." Yet the authors have the audacity to claim that preventing such fraud is worse than the fraud itself! The recent decision by U.S. District Court Judge Robert Hinkle allowing the State of Florida to carry on its process, refusing The US Department of Justice's suit to halt it by injunction, is evidence from the federal court that the wild accusations posited in this article cannot withstand legal, fact-based scrutiny. 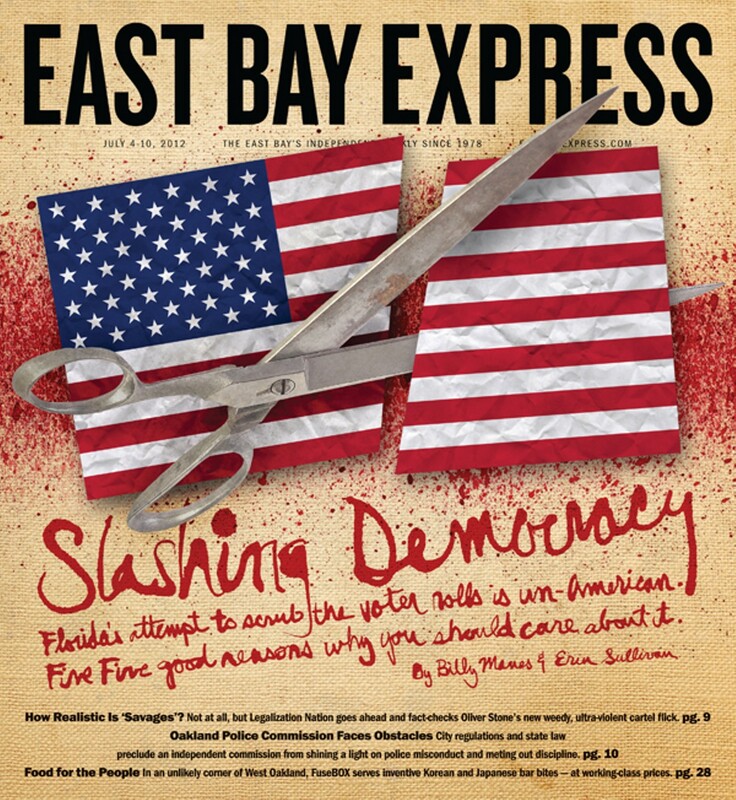 These East Bay Express editors have crafted here a provocative conspiracy treatise, complete with its adoration of yet another conspiracy theory from past House Leader Nancy Pelosi - and none of it holds water. It seems the Express favors writers whose dislike of firearms is so great that they cannot write an article about anything without dragging in the totally irrelevant topic of gun control. The latest example is the otherwise excellent article by Billy Manes and Erin Sullivan on the purge of Florida voter rolls by Governor Rick Scott on the pretext that the rolls are full of illegal aliens. The most amusing thing about this for me as a pro-gun progressive (there are a lot more of us than you think) is that the solution Manes and Sullivan advocate for addressing voter fraud without attacking large numbers of minority voters, severe prosecution of the rare cases of voter fraud, is the same solution advocates of civil rights for gun owners want used to prevent gun violence. They want current laws used for serious prosecution of those who commit gun violence, not senseless attacks in the form of gun bans on the rights of the 99 percent of gun owners who obey the laws. As for gun owners' attacks on Attorney General Holder, they are justified. He either concocted or signed off on a plan to allow US-made firearms to be transferred to Mexican drug lords so that when they inevitably showed up in traces of firearms at Mexican crime scenes, he could use this as evidence of the need to reinstate the Clinton-era ban on so-called assault weapons, firearms that were never popular with American criminals. What he failed to consider was that people would be murdered with these firearms, and one of those murdered would be a US Border Patrol agent who was slain by a drug smuggle using a gun he, Holder, allowed to leave the US. Holder would have gotten away with this deception if it was not for several honest licensed American gun dealers who reported suspicious buyers to the Bureau of Alcohol, Tobacco, Firearms and Explosives, and US attorneys from Arizona who were whistleblowers after they asked to prosecute the suspicious buyers and were ordered by superiors in the Attorney General's office to let the traffickers escape. No wonder he refuses to turn over documents to investigations by Senate and House committees. They show criminal offenses on Holder's part in the Fast and Furious scandal for which he should be arrested and tried. This article, as well as the initiative promoted by Rashidah Grinage and others, ignores a critical aspect of the work of a police commission or other public-safety oversight office for Oakland. That is, the improvement of public safety in Oakland, which is afflicted with outsize crime problems, including one of the highest murder rates in the nation. It is amazing to me that the writer, Grinage, and others seem to be able to overlook what Oaklanders experience every day and what is eating the heart out of minority and economically disadvantaged communities in this city. What about the black families whose children cannot succeed in school because they are traumatized when a parent or a sibling is shot? What about the hopeless job situation for so many young men in Oakland because small businesses cannot succeed in a high-crime environment? These are all consequences of failures not only of police but of a host of public safety-related aspects of Oakland governance. As David Sklansky at UC Berkeley pointed out, a police commission, to be successful, needs to be part of a series of coordinated efforts. One of the most significant functions of a commission is the actual management and coordination of all related public-safety work, including policing, social programs, probation, and other justice-system relationships. Again, the writer and Grinage et al seem to be blindfolded. Oakland has many problems with policing and police policy, well beyond discipline of officers who misbehave. Crime is out of control; police reform toward more community policing needs to be instituted; the number of sworn officers is half of what it should be; and violence-reduction programs fail because no agency is coordinating them. A police commission is a means to deal with these problems. The function of a police commission is far more than simply to discipline officers who misbehave. A commission also protects the legitimate functions of police, ensures high morale among officers, and ensures that police have the resources to be effective in protecting public safety. Oakland's citizens need not only ethical policing but also effective policing, well-coordinated with other public safety efforts. A police commission in Oakland could be a step away from the current situation in which police are tripping over their own feet while shootings continue every day of the year. I am glad the recall campaign is over. 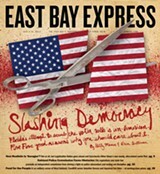 It has been divisive and takes attention away from real solutions that move Oakland forward. It's interesting to note that the most silent councilwoman, Kaplan, is also the most favored one. As brainy President Woodrow Wilson once said, "If you want to make enemies, try changing something." Change is what Mayor Quan is doing. Some police members probably dislike the pension contribution and the greater accountability that they now face. While cannabinoid levels are interesting, and even vitally important in rare cases (such as Jayden's), the true danger in untested cannabis comes from the potential pathogens — pseudomonas, aspergillus, and E. coli are routinely found by our laboratory (CW Analytical). While these microorganisms present little danger to healthy individuals, they can be deadly to someone with a compromised immune system. Thank you, David, for highlighting the effect on patient's health and safety that this crackdown has caused. In our July 11 music story "Tolerance and Zero Progress," we incorrectly stated that Matt Saincome booked Zero Progress' American Tour. It was in fact booked by his brother, Ed. Our July 11 music pick "Punk Funk Mob" contained a number of errors: It misspelled Femi Andrades' surname; stated that Andrades is a Berkeley native when she's from Oakland; and misstated that the band's drummer is named Mike Logan (it's Mike Williams).